This is a good build for a new player. It is straightforward and simple to play. The strength-based skill books this build will need can be found in lower level chests. Also, keep an eye on which books libraries are giving out. These books will change every in-game day. HINT: Raid enemy kingdoms to find chests. Also, guards will almost always drop keys to unlock them. This build is designed to hit hard. I have killed some rank 10 NPCs with a single hit and not just casters. This build does have a very low defense but it doesn't need it. It uses parrying and armor resists instead of defense to stay alive. Find a job board and join the soldier class. The soldier class can get a damage and constitution buff from a soldier monument. NOTE: Soldier monuments are rare and spawn randomly in the world. Take these additional skills: NOTE: All these skills are strength-based. * Parrying Skill. This will keep your character alive. Once you take this skill the "Defend Action" will work. Hit the defend key when your opponent attacks to greatly improve your chance of a parry. NOTE: You and your enemy must be facing each other to parry an attack. * Berserker Skill. This skill will increase melee damage output and has good powers for a melee damage build. * Weapon-Master. This will increase attack rating and also has good weapon powers for this build. Defeating enemies and finishing quests will reward you with experience. With enough experience and gold, a trainer can increase your abilities. When you need a higher ranked trainers use a traveling post to find a friendly higher ranked town. Once in the town, use your compass to find the trainers. Since training isn't free, make sure you loot your fallen enemies. Most loot can be sold to stores. * Strength (171)105/105 Train to the max. The primary attribute for this build. It increases damage/attack/strength-based skills. * Dexterity 25/44 Don't train. Mostly useless but would increase minimum damage. Not worth it. * Constitution 55/55 Train to the max. Increases your character's health and stamina. * Intelligence 25/40 Don't train. Useless in this build. * Faith 10/10 Untrain it completely. Lowing this stat will increase strength also faith is useless in this build. Train Damage Stance to Rank 10. Don't train Defense of Attack stances. 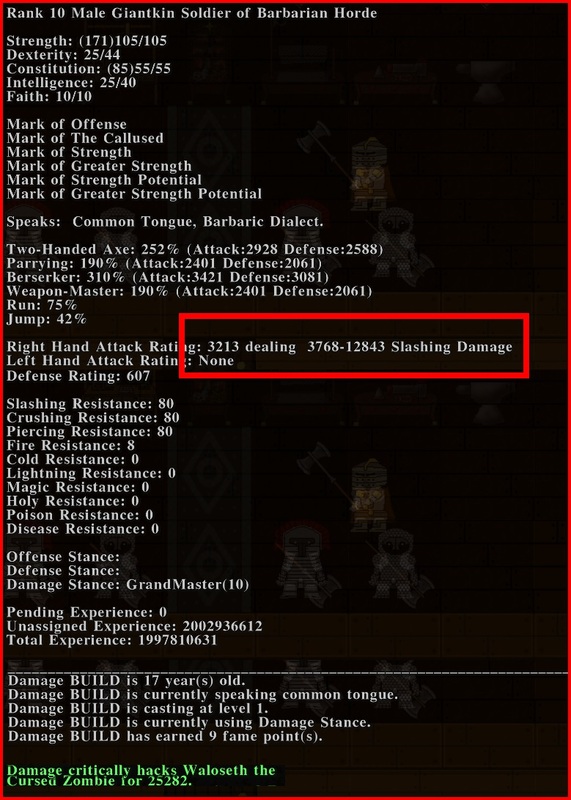 Two-Handed Axe Skill (252%)157% Train two-handed axe to the max. * Might Swing Through: Self Damage Buff: Train to max Rank 10. Buffs your melee damage. * Mighty Swing True: Self Attack Buff: Train to max Rank 10. Buffs your attack rating. * Greater Split: Melee Defense Debuff: Train to max Rank 10. Use it to hit high defense characters. * Greater Chop: Melee Slashing Expose: Train to max Rank 10. Your primary combat power. Parrying Skill (190%)157% Train parrying to the max. * Parrying Defense: Increase Defense: No not train. This build does not use defense. * Strong Weapon Parrying: Item Strength Buff: Train to max Rank 10. Buff all the equipment that you're wearing with this. * Parrying Conditioning: Stamina Recovery Buff: Don't train. Not enough trains left for this. * Focus parrying: Parrying Buff: Train to max Rank 10. A powerful/short-lived buff for emergencies. Has a long recast time. Berserker Skill (310%)157% Train berserker to the max. It adds directly to your damage. * Strong Will: Self Strength Buff: Train to max Rank 10. It increases your strength. * Battle Rage: Self Attack Buff: Don't train. It does not stack with Mighty Swing True. * Passion of Battle: Fear Immunity Buff: Train to max Rank 10. It gives you immunity to fear. * Berserker: Melee Fear Control: Train to max Rank 10. It allows you to make your enemies run away in fear. Weapon Master (190%)157% Train Weapon Master to the max. It adds directly your attack-rating. * Masters Strength: Self Strength Buff: Don't train. It does not stack with Strong Will. * Weapon Finesse: Self Attack Buff: Don't train. It does not stack with Might Swing True. * Masters Footing: Knock Back Immunity: Don't train. The full suite of heavy armor this build wears will absorb knockbacks. * Weapon Master: Knock Back Control: Train to max rank 10. This will allow you to knock back enemies. Run Skill (75%)134% Train run to the max. Run increases your movement speed. You will need this, your heavy armor will drop your run to around 75%. You will have to use equipment you find until you collect the items needed to craft your own. There are now crafting bosses for most crafting skills in the world so you no longer need to level up a separate character just for crafting your equipment. But before you can start crafting, you will need to collect crafting recipes and crafting resources. *Grandmaster Blacksmith Letter for directions to the master blacksmith. *Grandmaster Alchemist Instructions for directions to the master alchemist. *Any crafting recipes for Heavy Armor, Two-Handed Axes, and Jewelry. See the Official Crafting Guide for detailed information on crafting and where to find the crafting resources listed on the recipes you find and the resources listed below. Buff your character with all the buffs. Make sure your cast Strong Weapon Parry on all of your equipment. When going into a fight. Hit your enemy with Greater Chop to expose them to slashing. Use Great Split on high defense enemies when needed. Berserker and Weapon Master powers both have long recast, so use them wisely. If you get in trouble, use Focus Parrying. It will make your parries almost impossible to get past. Most enemies will drop fast from your damage output. Kill casters first. I have finished the Sword of Torn questline with this build but the boss battles were very difficult due to the magic damage. The fight with the Bloodwell in the Crystal Sea was the most difficult. The fight in the Elven Magic Tower in Grifmae Valley was difficult but easier to manage. This character as build with the guide has all physical resists and no magic resistance. To counter this make sure you wear the cloak you receive at the beginning of the quest to give your character some magic resists. It will also help to replace a few of your armor pieces with cloth imbued with magic resistance. Here is the character sheet screen pasted together to show this build finished at Rank 10.